A picture of a F.A.M.P.S. starter kit. F.A.M.P.S. was a toys-to-life game created by Girl Tech and produced by Mattel. It was the second toys-to-life game to ever hit the market and drew heavy inspiration from U.B. Funkeys (the first toys to life game). 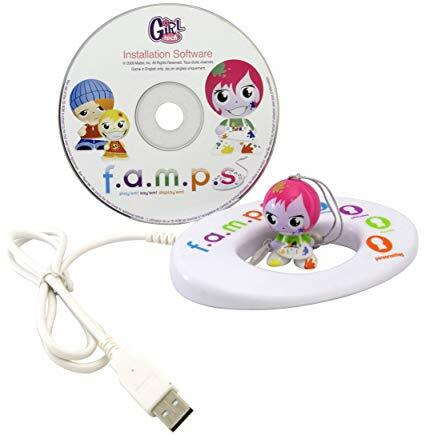 Unlike other traditional toys to life games F.A.M.P.S. was considered more of an application than a game allowing users to customize their desktop and emails from within the game. Players were able to watch famp come to life by placing them inside the famp's portal that would plug into your PC. Each famp unlocked new mini-games to play and new customization options for the players desktop. The brand was created in 2009 and was discontinued in 2011. Only one series of 12 figures were ever produced for the game before it's cancellation. Due to the game only being available to download online, no known copies of the game still exist. The only official F.A.M.P.S. media left is the commercial for the game that was found in January of 2019 and the support page on the Mattel website. Archive of the F.A.M.P.S. website.